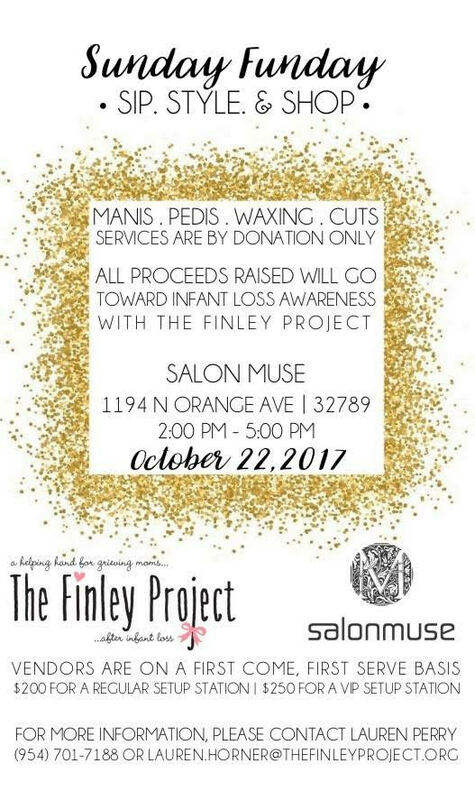 Salon Muse is proud to be partnering with The Finley Project for a special benefit on Sunday, October 22, 2017, to raise awareness for a cause near and dear to our hearts. The Finley Project provides grieving mothers with a seven-part Holistic Program that aims to support them emotionally and physically, at no financial cost. Please join us for manis, pedis, waxing, mini facial treatments, and refreshments, as we honor The Finley Project. All services are by donation and 100 percent of the proceeds will go directly to the Finely Project to help mothers in their time of need after losing their baby. If you are unable to join us for this event, please consider donating to the Finley Project online. The Finley Project is the nation’s only organization that offers a seven-part Holistic Program to help mothers who have recently lost a baby. Their mission is to take care of grieving mothers immediately following the loss of a child by supporting each mom with their child’s funeral planning, meal and grocery gift cards, professional massage therapy, professional house cleaning, support group placement, one-on-one licensed mental health counseling, and support from a volunteer support coordinator. Salon Muse in WInter Park is proud to offer some of the best salon services for men and women throughout Florida. We offer a full-service hair salon that offers cuts, color, highlights, conditioning treatments, extensions and more. In addition to our hair services, we also offer manicures and pedicures at our upscale salon, so you can treat yourself to a luxurious nail experience after your hair appointment. If you’re in need of a rejuvenating facial or you have a teen who suffers from acne, we also offer skin renew and anti-aging treatments. Check out our portfolio online or contact us today to schedule an appointment!